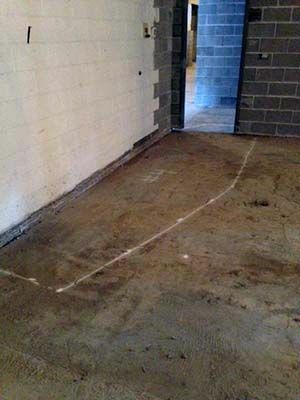 CSArch, an architectural firm based out of Albany, New York was called in to repair cracks found in the concrete foundation of an elementary school in Ballston Spa, New York. CSArch had previously located a void, or pocket of air within the foundation, and repaired it by cutting away the slab and inserting more concrete to support the newly inserted cement slab. After completing that project they noticed more of the same types of cracks that led to the discovery of the first void. CSArch then had to determine if and where more voids may have been located within the schools foundation. They could cut away the concrete in all of the areas where cracks had formed, which would have been very time consuming and expensive. The other option they had was to use a relatively new technology they had heard of, ground penetrating radar, which would not require all of the removal of concrete, but would still locate any areas that may have had pockets of air beneath the surface. They decided that using the non-destructive form of testing, GPR, would be most beneficial to their project. CSArch then contacted Ground Penetrating Radar Systems, LLC, to determine if, and when they would be able to locate the possible voids. When they called the technician that covered the Albany area they were pleased to hear he was available to complete the project that day! Jim Bell of the Upstate, New York office mobilized to the site and began marking out all of the possible voids that were located in the rooms the cracks were located. He was able to quickly locate areas that appeared to have a change in density within the slab that could have led to the creation of voids beneath the surface. In addition to finding voids, Ground Penetrating Radar Systems, LLC. has the ability to locate and map out underground utilities and storage tanks, rebar, post-tension, and conduit prior to saw cutting and trenching, and in some cases unmarked graves. If you have need of any underground imaging services please contact our Upstate New York office, which serves the Buffalo, Rochester, Syracuse, Ithaca, Binghamton, and Albany areas, as well as all of the areas in between. If you are interested in obtaining more information or a quote please contact Jim Bell at (315)715-5137 or jim.bell@gprsinc.com.